Nothing quite compares to freshly caught hot smoked fish. I must admit that some of my earlier smoking fish sessions have produced less than perfect results. I finally caught on and would like to pass on the following advice. This is really a method better thought of as quick smoke/cooking, rather than the more involved, and much slower, cold smoking process traditionally used to preserve meats. 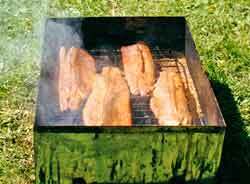 Fish cooked in the smoke/cooker should be eaten straight away. If kept in a fridge treat as cooked fish! Start by preparing your fish the moment they are caught by getting them into ice immediately. Fish flesh goes bad quickly if not keep cool. I like to remove all the bones from a fillet and leave the skin in place. Sprinkle salt over the fillets and leave for 30 minutes to draw out some of the moisture. Rinse in cold water then pat the surface dry with a paper towel. You can omit this step if you wish but it is essential for watery species such as red cod. Rub brown sugar into the flesh. Put heaps on. This acts as a buffer to the smoke and improves the taste. Too much will simply run off so there is no danger of over sweet fish. You can add a drop of whisky, pepper, herbs and the like at this stage. The brown sugar really is an essential ingredient; without it the taste is too bitter. Line the smoker with foil. This makes it easier to clean. You only want a handful or two of manuka sawdust – too much also gives a bitter taste. 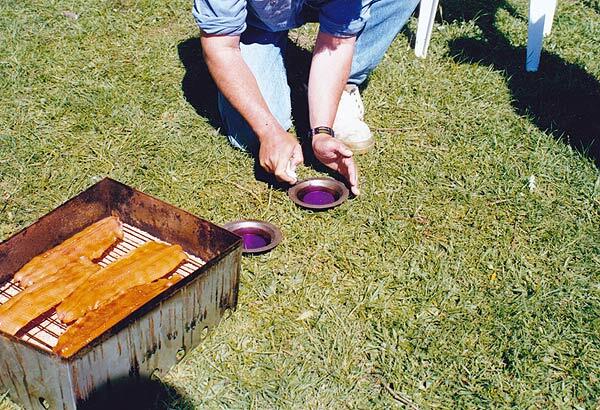 Metal dishes burning methylated spirits spirit are used to cook the fish and burn the sawdust or fine wood chips. Place the two metal dishes filled with methylated spirits spirit on the ground. Light the spirits and place the smoker over them. Resist lifting the lid until the methylated spirits has all burnt off. This should take about fifteen minutes. A smoke/cooker is very portable and great taken on your trip to the lake. Fresh fish cooked on the spot. You just can’t beat it for taste! 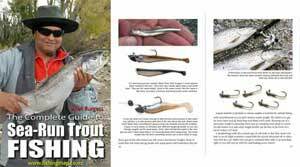 Try mullet, kahawai, rig, and cod, as well as trout and salmon. Smoking fish is well worth the effort and easy to do! Any tips, questions, or advice to add? Please comment and/or like below using Facebook..